When we think of intelligent animals, we think of whales, specifically dolphins, apes, elephants, dogs, crows and parrots. I have written much about this subject, and you can find the posts by selecting Animal Intelligence from the categories dropdown on the right. We generally do not think of octopuses as intelligent. However, octopuses, as well at cuttlefish and squid, commonly classified as cephalopods, are highly intelligent animals. 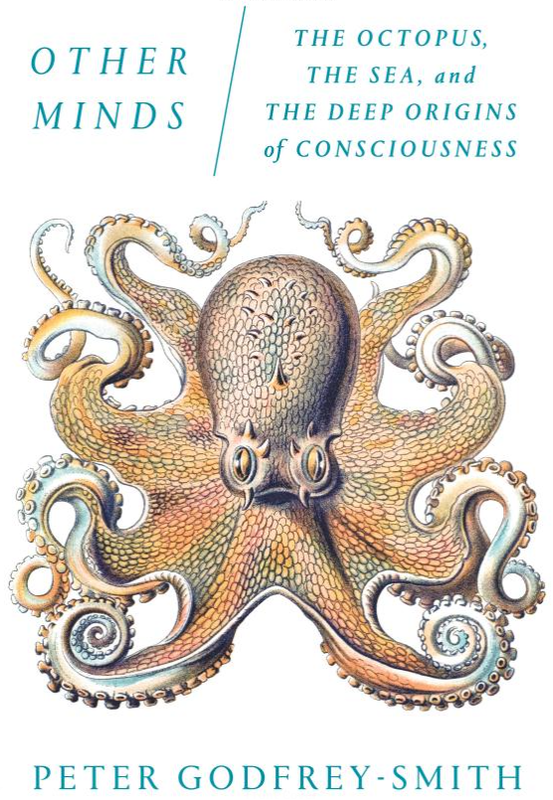 Peter Godfrey-Smith, the author of Other Minds, is a distinguished philosopher of science and a skilled scuba diver, who started studying octopuses in the process of thinking about consciousness in humans and in animals. Other Minds tells the story of how animal life first started on earth, and how the invertebrates started splitting off from the vertebrates some 500 to 600 million years ago. As it turns out, cephalopods are invertebrates, and all other intelligent animals are vertebrates, including humans. The common ancestor of both humans and octopuses are small flat wormlike creatures that lived over 500 million years ago. As a result, an octopus is about as different from a human as you can get, and still have two eyes – and a mind. Godfrey-Smith illustrates many astonishing examples of octopus intelligence and it becomes quite clear that, yes, they are really bright, and yes, they are very alien, very different from us. He says that the closest we are likely ever to come to meeting an alien intelligent being is going to the aquarium and watching an octopus. I searched and found a few astonishing videos. The first one is of an octopus escaping from a ship’s deck. Since an octopus has no hard parts, no bones, no shells, he can squeeze himself through a hole as small as his eyeball, his hardest part. The video below demonstrates that. Octopuses can also learn to use tools and solve complex problems. Here is an example of an octopus opening a jar into which it has been placed. There are other examples that show how an octopus can open a jar from the outside to get to the prey locked inside. I am highly interested in animal intelligence and alien intelligence, so this book turned out to be a treasure trove of information and great anecdotes and stories. I learned much about the evolution of life on earth, and the development of intelligence and consciousness. If you have similar interests, this is a book you must read. The author is trying to be factual, and the book is therefore more of a text book than an entertainment book, which makes it somewhat challenging to read. But I enjoyed it thoroughly, and I am sure I’ll refer to it in the future. You might enjoy Pets on the Couch, by Nicholas Dodman, DVM. It’s astonishing how close our neurochemistry and emotions are to those of dogs, cats and even parrots. Wow, I will like that. Thanks for the lead. on October 12, 2017 at 10:11 am | Reply Tom W.
I thoroughly enjoy your blog (what I’ve read so far at least), and I like your mind! Thanks, Tom. I will read the book and check into The Future is Wild. I need good recommendations!